Week 10 Results of Hi Ho Books Away! The last week. It is the end. 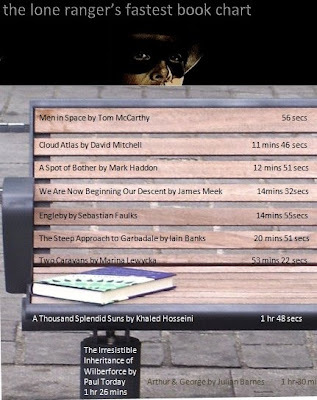 I leave Iain Banks on the bench and wait. A young couple approach the bench. They look like student types. She points the book out to him. He swoops, picks it up and they walk off towards the local tavern, book held high in his hands. The oldest partners in crime routine. "She made me eat the apple your honour." 10 books given away to the value of £ 150. 10 lives impacted by a book that lay across their path? Who knows what effect those books had. I ride now into the sunset. Thanks for following me on my journey. Rufus beat me to it, damnit. Come on, everyone. This is where we stand up and yell, "Bravo! One more! We love you Lone Ranger!" Hear the crowd, stamping its feet, shouting itself hoarse, LR? Sign off, TV series canceled. Have fun with your family, but I know you'll be back.